All hands on deck! 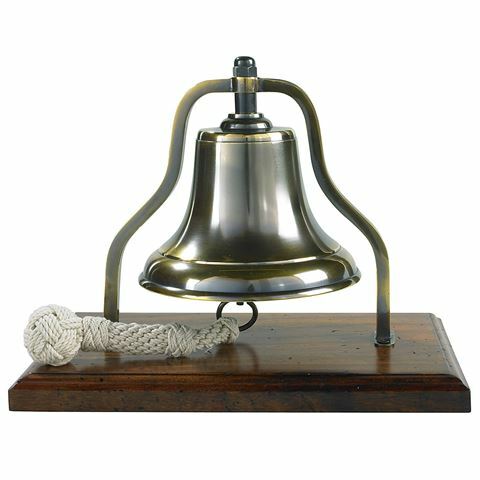 Whether you’re assembling your ship’s crew or just the hungry hoards for dinner, this replica of a Purser’s Bell is sure to strike the right tune. Made from brass with an antiqued appearance, it stands on a wooden base with a distressed appearance. Pull the rope to ring, and cry out to those asleep in this cabins. Pair it with a compass and a galleon, and you’re good to go. Cast from brass, with a duo tone bronze finish. Pull the rope to ring! Dimensions: 24cm (l) x 21cm (h) x 15.5cm (w).